This temporary exhibition can be visited from September 26, 2018 to March 31, 2019 at El Born Center of Culture and Memory. El Born Center of Culture and Memory of Barcelona helds a new temporary exhibition until March 31st, 2019. «A childhood under the bombs» is inspired by the bombings suffered by the city of Barcelona between March 16 and 18, 1938, that killed 815 civilians and among them 118 children. 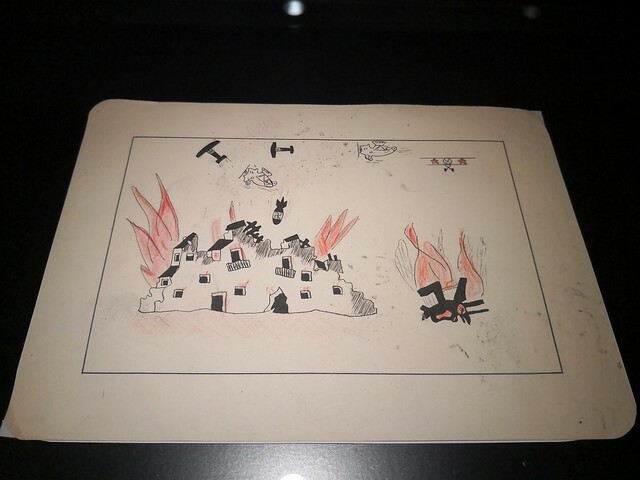 Eighty years after that historical point of inflection that allowed the use of air force indiscriminately against the civilian population, the exhibition is an invitation to reflect on the memory and the experience of the children who survived those traumatic days. Curated by the historian Jordi Guixé, director of the European Observatory on Memories of the University of Barcelona’s Solidarity Foundation (EUROM), the exhibition highlights over 70 drawings of children of the private collection Ramon Soley and of the Archive of the Institute of Education of Barcelona. It also includes a series of four remarcable works by the Catalan artist Josep Guinovart, a witness of the bombings of Barcelona and Agramunt, a small village in the countryside where his family moved trying to flee the war when he was eleven years old. All his work as an adult artist would be deeply marked by the woes of the trauma he experienced and the need to denounce wars. The exhibition also proposes a reflection on the current situation of children in nowadays conflicts, channeled through the interactive work “Area of security” of Xavier Bové and the images of photographers Anna Surinyach, Àngel García, Pau Coll, Edu Ponces and Toni Arnau. Graphic material of the exhibition is available for download.